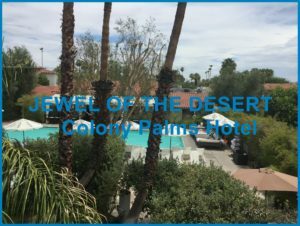 If Cairo, Egypt is known as the Jewel of the Nile, then The Colony Palms hotel in Palm Springs, California deserves to bear the title of the Jewel of the southern Cali desert. I was one of the lucky ‘chosen ones’ invited to attend what is called a FAM trip, hosted by the Colony Palms Hotel. This three-day weekend happened to fall at a perfect time for me, as not only was I in need of some pampering and quality “me” time, I had not had an actual vacation in over three years. Yep, you heard me right… three years. I was so excited and honored to be selected to attend this luxurious event and represent—along with 8 other lucky recipients—the amazing organization known as Association for Celebrity Personal Assistants (ACPA). The Colony Palms has a rich history as varied and eccentric as its litany of its owners. It was originally built in 1936 by Al Wertheimer—a notorious mobster, head of the Purple Gang—as a hotel called The Colony House. Then, after World War II, Robert Manor purchased the hotel and renamed it Howard Manor. Robert was the son of an Academy Award-nominated actress, and his father, Howard, was the owner of the famous racehorse Seabiscuit. As such, Robert brought a rich cache of Hollywood royalty to the hotel, and within a short time, the property became a trusted escape when the Hollywood elite needed a desert retreat. Annie and Dave Margolis, Hollywood socialites, ended up purchasing the hotel from Robert in a handshake deal over cocktails one night, continuing the glamorous legacy of this enchanting property. Frank Sinatra was also a part-time residence at the hotel for several years, and his two-story suite has been renamed the Palme D’or, and has been modernly redesigned as an elegant space for special events or meetings. 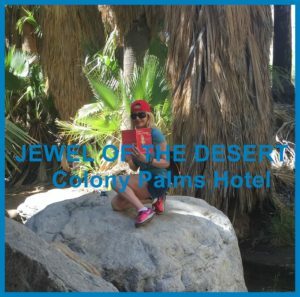 After the two-hour drive to the desert Friday morning, I was not only anxious to pee upon my arrival at the Colony Palms, but I was parched as well. Karen Smith, the Director of Sales for the hotel, greeted me personally upon my arrival. As I was desperate to pee, she let me use the loo in the front managers’ office while the valet took my bag directly to my room. Karen then escorted me to their top suite where they were hosting a welcome reception for my group. 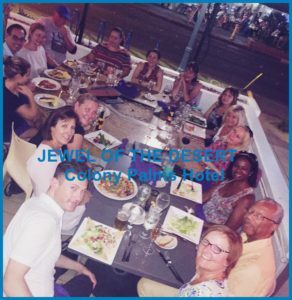 I was delighted to discover that the Colony Palms Hotel had charming Spanish-style architecture, and I immediately felt the easy and comfy vibe, which is truthfully the essence of this special property. As we awaited the arrival of our entire ACPA entourage, Karen and her team had champagne and chocolate-covered strawberries for us to sip and munch on while we awaited the others. Within minutes, I no longer felt parched, and the chilled champagne instantly put me into ‘relax-mode’, the chill-vibe that inhabits this entire enchanting property. 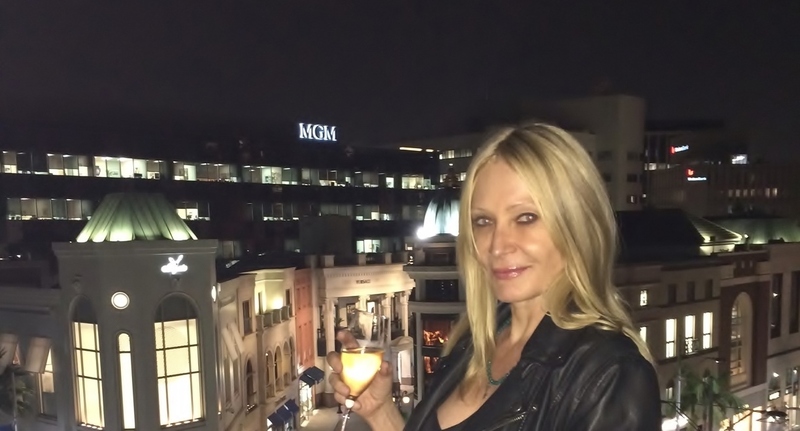 As we grabbed our freshly topped-off glasses of champagne, Karen gave us the official tour of this delightful 57 room, suite, and casita boutique hotel. The hotel has been recently completely renovated, keeping the integrity of the architecture and décor. As it was 110 degrees that day, I think we were all immensely grateful that the air-conditioning had also been upgraded. The Moroccan inspired décor and Spanish tiled floors makes this hotel elegant yet livable at the same time. After the tour, and of course more champagne, we settled into our rooms where lovely gift bags were waiting for each of us. I was thrilled with my room: it was large and cozy and came equipped with my very own patio. Some of the casitas had their own outdoor tub or fireplace, each room, suite or casita furnished with its own unique features and amenities. I really love the individuality that embraces each corner of this hotel, it is refreshing to not stay in a cookie-cutter hotel, where every room has the same mundane décor. 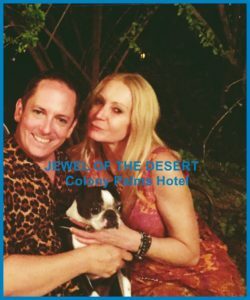 The Colony Palms Hotel has truly embraced its eclectic vibe and atmosphere. I ended up chilling for the rest of the afternoon pool-side. Even in the heat, laying under the umbrellas and taking the occasional dip in the pool, was still refreshing. As well, there is chilled cucumber water available 24-7 poolside. Because this hotel boasts a relaxed vibe, the pool-patrons were very friendly. I immediately started to chat with my lounge chair neighbors, two women who were considering renting out the entire hotel to host their wedding. The Colony Palms is available as a buy-out, and not only does it have lovely outdoor spaces to host a wedding, can you imagine how much fun it would be to take over an entire hotel with your friends and family? At this point, I decided that I wanted to have my wedding here, buying-out the entire hotel. The only caveat is that I need to find a groom now, and hope he has the financial stability to make my dream come true. That evening, we were treated to cocktails at a local high-end shopping store, Angeli Fashion of Palm Springs. The owner, Angeli, designs and brings his bespoke Italian fashion to the shopping district of Palm Springs. This is his only store in the USA. I ended up scoring a beautiful pair of patent-leather turquoise colored sneakers! As well, the hotel is in walking distance to downtown Palm Springs, so you can literally walk to a multitude of restaurants and shops. We were treated to an outdoor dinner at Kaiser Grille, and the food was absolutely delicious. After dinner, some of my group hit the casino on the way home. As I had just spent my ‘wad’ on sneakers, I decided gambling was literally ‘not in the cards’ for me, so I elected to head back to the hotel and veg by the pool. A night swim in the warm desert air seemed like the perfect way to end this wonderful day. Imagine my delight as I lounged beside the pool that evening to discover another marvelous attribute of this lovely hotel. You see, I not only met another nice couple at the pool, I also met their dog, Diggy. 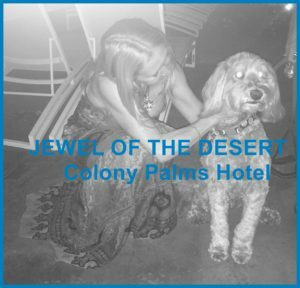 The Colony Palms is a dog-friendly hotel, and anyone who’s known me for five minutes knows how much I love dogs. If you have ever had a dog and had to leave your dog with a pet-sitter, you will understand the absolute joy in being able to bring ‘woofy’ with you when you travel for business or pleasure. It is, well, how can I put it into words, well… not only do you have your best-furry-friend with you, it also alleviates the worry of having someone else take care of your fur-baby. After all, no one is a better parent to your child than you, right? Yep, I am right! The next morning, after waking up to a beautiful continental breakfast brought to our room, we jumped into Safari Jeeps and headed up Indian Canyon to tour (red-jeep.com) what could only be called an Oasis in the desert. When you drive up into the desert mountains, there are parcels of land that have aqueducts of water running under the earth allowing an actual tropical oasis to exist. We hiked up the mountain, learning the history of the native population, and even though it was hot, it was fascinating. I did not realize that Palm Springs had so many adventures available for exploration. After our hike, we were treated to a lovely lunch at one of the finer eating establishments in town, called restaurant 849, before we headed back to the hotel for spa appointments and pool time. The hotel boasts a high-end spa and I had a wonderful relaxing facial after another day of pure bliss. That evening, we were indulged with a three-course dinner at their famous Purple Palm restaurant, with a menu created by chef Nick Tall, boasting organic and seasonal fare. Some of the ingredients were actually grown on the property. It was a yummy end to a wonderful day in desert paradise. That evening, I was exhausted, but I must add that normally I have difficulty sleeping when I am not in my own bed. 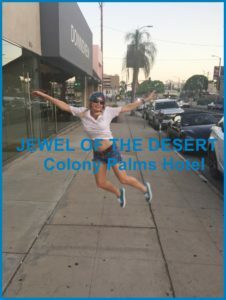 My two-night stay at the Colony Palms was so cozy and relaxed, and the bed and bedding so comfy, that I had absolutely no issues sleeping, a rare occurrence for me when I travel. The following morning, we were once again spoiled with a lovely brunch at the Purple Palm–champagne and cocktails, of course, included. However, after two days of a heavy consumption of delicious and decadent champagnes and wines, I decided to err on the side of caution, sticking to beverages that would ensure that my return drive home, and the lives of everyone else on the freeway, would be safe. I would like to add that the front reception area has coffee, tea and water available 24/7 as well, and each morning I walked in my pajamas—yes, it is true, I have no shame—to get a couple of cups of hot coffee to take back to my room. I love a hotel that doesn’t ask you to pay for your coffee or tea in the morning. One of the many features that make the Colony Palms Hotel charming and inviting to say the least. I was actually sad when I had to leave paradise on Sunday afternoon to head back to La-La-Land. By this time, I felt like I was part of the Colony Palms family, feeling like a teenager who wasn’t quite ready to leave the nest. The whole experience was truly amazing. As well, I have kept in contact with some of the guests that I met pool-side during my stay. The Colony Palms is the kind of hotel where you could actually go as a single person and have fun, as the vibe is so relaxed and pleasant that even ‘LA folks’ are friendly when they stay here. 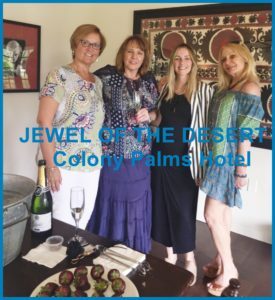 Thank you so much to Karen Smith and Peggy Trott, the General Manager from the Colony Palms Hotel, and Christine-Kenny-Moriarty from the Palisades Hospitality Group, for the wonderful three-day adventure, and for letting me experience this ‘Jewel of the Southern Cali Desert’ aka The Colony Palms Hotel! P.S. Hey fellow DOG LOVERS! Check out my book called Where the Dogs Go available on Amazon and Barnes and Nobles! « Love and Hate List – 10 Reasons I LOVE You!